Hortus Camdenensis | Centaurea cyanus L.
Fully hardy annual with dark blue to pale blue, sometimes pink or white, flower heads in spring and summer. Highly variable in height, to 80cm. [RHSE, Hortus]. An ancient garden plant of medicinal use. The juice of the petals makes a blue ink and can also be used as a non-permanent dye for linen. ‘Small Blue Bottle. Cyanus minor. 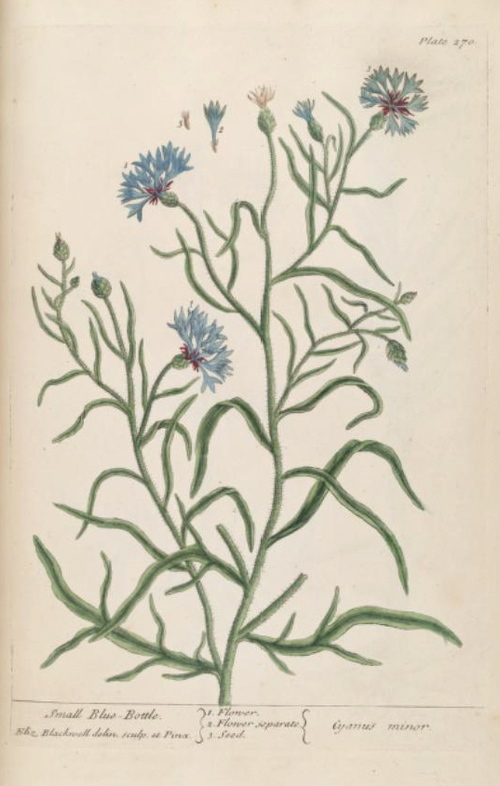 It grows near two feet high, the leaves are a willow green, and the flowers a fine blue. It grows amongst the corn, and flowers in June and July. 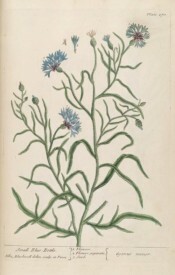 The leaves and flowers are said to have the same virtues as those of the great Blue-Bottle, see Plate 66. [This appears to be a garden form. ‘It grows in gardens and flowers in June. This is reckoned among the vulnerary plants, the juice being commended against bruises and contusions which come of falls, though a vein be broken and the party spit blood; as also to heal any cut or green wound.’] Some commend the distilled water of the flowers for sore, inflamed and bloodshot eyes. The infusion and powder of the flowers are given as a remedy against the jaundice.’ Blackwell pl.270/1739. Listed in all published catalogues [H.53/1843]. Possibly introduced as a source of dye although it has long been a popular garden plant.